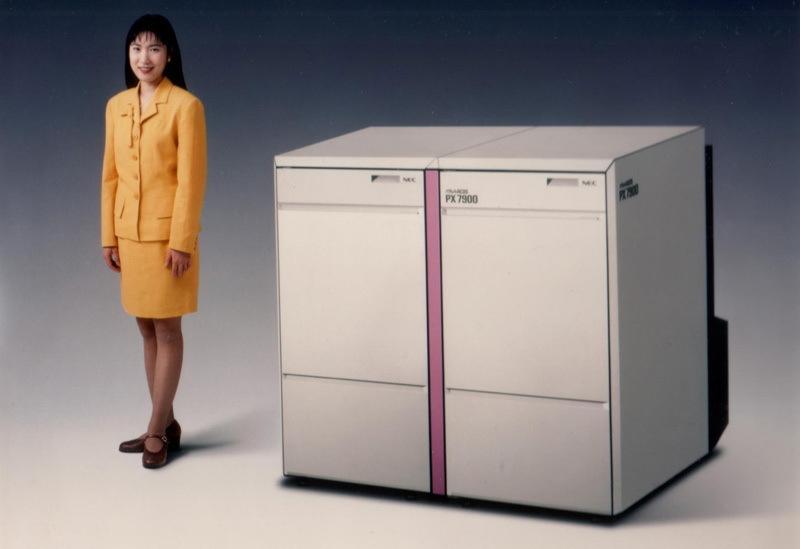 NEC began selling the large PX7900 mainframe in March 1996 as part of the Parallel ACOS series. The PX7900 ran the newly developed ACOS-6/NVX PX operating system and maintained full software compatibility with the large ACOS system 3700 and ACOS system 3900 mainframes. With the addition of the PX7900, the Parallel ACOS series of next-generation computers, which took advantage of CMOS technology and parallel-processing technology, supported all NEC operating systems: namely, ACOS-2, ACOS-4, and ACOS-6. The PX7900 used a high-performance CMOS processor that contained the functions of a large mainframe on a single chip. By combining up to eight of these processors in a shared-memory CPU topology, the PX7900 increased its hardware cost effectiveness by about three to five times of that on previous models. Up to four of these shared-memory CPUs (i.e., up to 32 CMOS processors) could be connected to form a parallel file-sharing system that shared magnetic disk units and other components. Performance could be scaled by about 18 times from the minimum configuration to the maximum configuration, making construction of highly flexible systems feasible.